Control is Thomas Garrison from Santa Cruz who works as a branding / body modification artist and as a mastering engineer at his own Misanthrope Studio and has also initiated the industrial / ambient project Exsanguinate. He made a name as one of the finest American power electronics acts since the end of the nineties with a multitude of releases and highly regarded live performances in Europe and the US. He transcends the pure rage associated with power electronics and reveals the darker, more infectious and sinister emotions that build that fury. Control’s work is so conscious of creating mood and atmosphere that it almost defies the genre that it caters to. 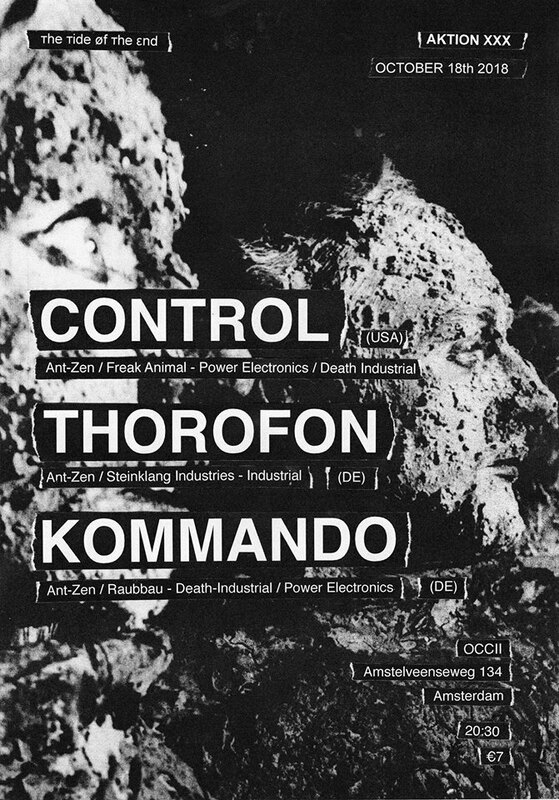 In 1996, Thorofon was launched and has over the past two decades grown to become a remarkable project in the German power noise / industrial movement. In their sound the ingredients of industrial music, cold power electronics and menacing electronic body music coalesce in a most perfect way. Far from being nostalgic Thorofon return to their roots – just to start over again. Kommando was Dan Courtman’s pre-Thorofon project which released two cassette tapes and two cds during its initial existence. It’s musical trademark right from the start has been to find footholds that belie the confrontational nature of the power electronics genre by pairing subtlety and diversification with aggression and rabidness. Death industrial, power electronics and dark ambient are symbiotically combined in a mesmeric and ritualistic way and produce dark, gloomy atmospheres delivered with intent and dedication. Brick walls of slow-pace kick drums and immersive loops build a solid foundation for heavy synth lines, noxious waves of distortion and well-thought-out vocal processing.